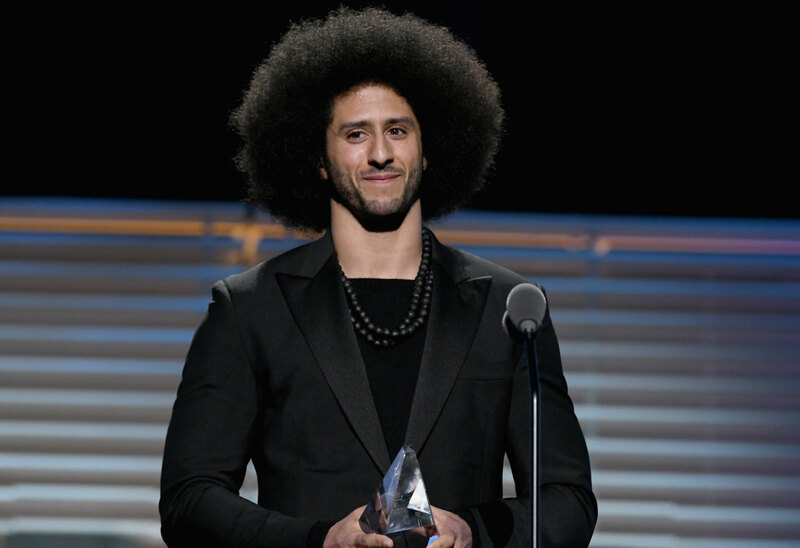 Colin Kaepernick, former San Francisco 49ers quarterback, and activist was awarded the Sports Illustrated Muhammad Ali Legacy Award on Tuesday night. Beyoncé Knowles, who has also protested police brutality lyrically through songs like “Formation,” presented the award to the NFL player. Her song “Formation” was overtly political, revealed just one day before the Super Bowl and performed at the halftime show in 2016 — the same year Colin began kneeling during the National Anthem to protest racial inequality and police brutality. Colin’s demonstration sparked a heated national debate between those who view his decision not to stand for the National Anthem as a sign of disrespect toward the military and those who support his fight against racial inequality and the method in which he decided to draw attention to the issue. Before introducing the 30-year-old activist, Beyoncé echoed that message. “It’s been said that racism is so American that when we protest racism some assume we’re protesting America. So let’s be very clear: Colin has been very respectful of the individuals who selflessly serve and protect our country and our communities and our families," she said. President Donald Trump has also been a loud critic of Colin and in September of this year brought more attention to the National Anthem protest debate when he suggested that NFL owners “get those sons of b*****s off the field,” referring to players who decide not to stand during the anthem. The skilled quarterback still remains unemployed by the NFL, and many believe that he is getting blackballed as a direct result of his social activism on and off the football field. Despite parting ways with the 49ers and not being signed by another team, Colin has still continued his pledge to donate $1 million of his salary and all earnings to “organizations working in oppressed communities,” specifically those affected by the racial inequality. In October, the activist filed a grievance against the NFL, alleging that he remains unsigned as a result of collusion by owners following his protest. Colin has also recently been honored by the ACLU of Southern California with the Eason Monroe Courageous Advocate Award and was named GQ magazine's "Citizen of the Year"